Hi friends! I hope you're doing well. We are ok. Brady is in his last month of school and Parker has another month. I can't believe how fast the school year flew by! 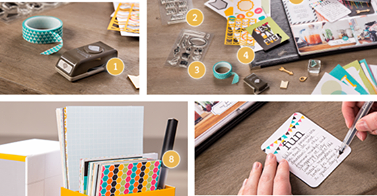 I'm super into Project Life lately and I'm really excited about the new Project Life products coming out by Stampin Up. (The photo above is from their website.) I wanted to let you all know that I'm having an online Stampin Up party in case you don't have a demonstrator. I KNOW a lot of people have demos but I figured if on the off chance that you want product but you don't know anyone to order from, I'd put this info out there.